The IDEAL Adjustable Torque Screwdriver is a quality control device used to provide consistent user-settable torque in varying assembly or maintenance applications in accordance to 2017 NEC. 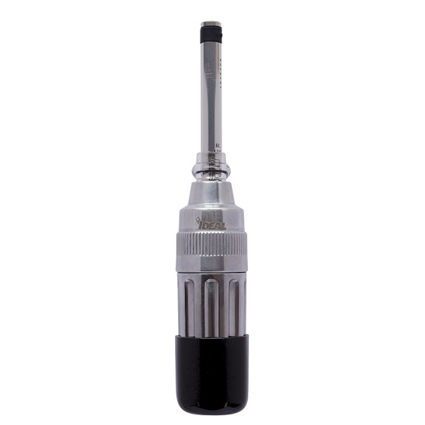 The screwdriver includes an adjustable torque range of up to 36 in. lbs. (bi-directional accuracy, +/- 6%) and unique torque limiting clutch that will disengage once the preset torque has been reached. This feature prevents over-tightening which can cause possible damage to components and final products. The IDEAL® line of spiral step bits enables you to save time with titanium nitride spiral cutting action. Each step has a gradual relief that eases into each cut reducing the need to change drill bits. This provides an economical way to save you valuable time on the project. SAVE TIME: Drill, tap, and deburr in one single operation.